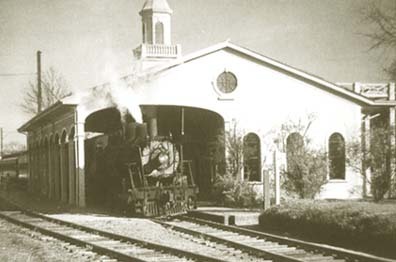 The History of the Lexington Branch, from Railway to Bikeway. The history of the Minuteman Bikeway. View this beautiful and informative presentation by Sam Doran and Tom Fortmann which was presented at the Lexington Depot on the occasion of the 25th anniversary of the Minuteman Bikeway. Minuteman Bikeway Video. Revival, The Story Of The Minuteman Commuter Bikeway has been posted on YouTube. Upload your Photos. I get a lot of request for photos of the Minuteman Bikeway so we have decided to build an archive of Bikeway photos available for downloading from this website. If you wish to donate photos of the Bikeway, you can upload them via the contact page. Photos must be smaller than 25mb and in PDF, JPEG, or PNG formats. Please only upload files that can be used for any purpose without compensation or attribution. Communicating with other cyclists using the Minuteman Bikeway. mmbikeway@gmail.com -- is the email to reach all three town committees/reps about conditions on the bikeway, questions, etc. On Twitter use @bikeminman. For current conditions on the Bikeway, follow @bikeminuteman and @pinwheeels on Twitter. Submit current Bikeway conditions to mmbikeway at gmail dot com. The Minuteman Bikeway passes through the historic area where the American Revolution began in April 1775. Today, the Minuteman Bikeway is one of the most popular and successful rail-trails in the United States, enjoyed for both healthy recreation and transportation. The bikeway has become a new type of “Main Street” where neighbors and strangers alike come together while riding, walking, or skating on the path. In 2008, Rails-to-Trails Conservancy inducted the Minuteman Bikeway into the national Rail-Trail Hall of Fame. Built by the Commonwealth of Massachusetts on an inactive railroad right of way, the Minuteman Bikeway has become a treasured regional resource, used by local residents and visitors from near and far. Connecting to the Alewife “T” Station in Cambridge, the bikeway provides an easy way for bicyclists and pedestrians to travel to and from subway and bus lines, serving to reduce automobile traffic in the area. The bikeway is collectively managed and maintained by the four communities it passes through: Bedford, Lexington, Arlington, and Cambridge. Bicycles are allowed on MBTA Commuter Rail and subway trains (Red, Orange, and Blue Lines) all day on weekends and during off-peak hours on weekdays. NOTE: You do not need a special pass or permit to bring your bike on the T, so it’s easy! For MBTA bike-accommodation guidelines, see www.mbta.com/riding_the_t/bikes. Narrow Gauge Rail-Trail (Bedford). Stone-dust trail near the end of the Minuteman Bikeway in Bedford which extends to North Billerica. Battle Road Trail – Minute Man National Historical Park (Lexington, Lincoln, Concord). Stone-dust trail providing cycling and walking access to the national park's historical and natural resource areas. See www.nps.gov/mima/index.htm. Linear Park Path and Somerville Bikeway (Cambridge, Somerville). Paved bikeways from Alewife Station in North Cambridge to Davis Square and beyond in Somerville. Plans are under way to extend this path to Boston. See www.pathfriends.org. Alewife Connector and DCR Alewife Greenway Paths. These are multi-use, community trails along the Alewife Brook and State Department of Conservation and Recreation's Alewife Reservation [map]. For more information, see the Friends of the Alewife Brook Area Community Paths website at http://www.pathfriends.org/alewife. Charles River Bike Paths (Boston, Cambridge, Watertown). 14-mile paved loop traveling alongside both banks of the Charles River from the Museum of Science in Boston to Watertown, passing through the Boston Esplanade. See www.mass.gov/dcr/parks/metroboston/charlesR.htm. Nashua River Rail-Trail (Ayer, Groton, Pepperell, Dunstable). 11-mile paved trail, featuring spectacular wetlands scenery. See www.mass.gov/dcr/parks/northeast/nash.htm. Bruce Freeman Rail-Trail(Chelmsford, Westford, Carlisle). Phase 1 of this trail is complete through Chelmsford into Westford. The trail will eventually reach Framingham. See http://brucefreemanrailtrail.org/visit-bruce-freeman-trail/. Assabet River Rail-Trail Proposed bike path linking the communities of Marlborough, Hudson, Stow, Maynard, and Acton; much of this trail parallels the Assabet River. (Portions of this bike path are currently being constructed.) See http://www.arrtinc.org/. For a complete listing of bike paths in Massachusetts (both existing and future), see MassBike’s website at www.massbike.org/resourcesnew/pathstrails. http://www.massbike.org/resourcesnew/pathstrails/. For a directory of rail-trails in the USA, see www.traillink.com. 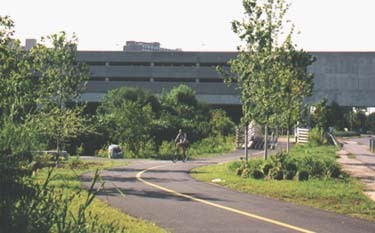 The Minuteman Bikeway connects to the Alewife MBTA Station in Cambridge, providing transportation access to subway and bus service. 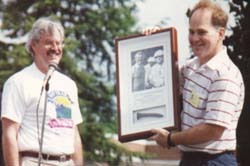 Alan McClennen, Jr., and Tom Fortmann at the Minuteman Bikeway opening ceremony, Lexington Center, 1993. In Lexington in 1993, the Minuteman Bikeway was dedicated to the memory of Jack Eddison, who served many years as a Selectman and worked to champion the bikeway project. In Arlington in 2000, the bikeway was dedicated to Donald Marquis, who served 34 years as Town Manager and was also intrumental in the bikeway's completion. Twenty years in planning, the Minuteman Bikeway might still be a dream if not for the tireless efforts of two community advocates: Tom Fortmann of Lexington and Alan McClennen, Jr., of Arlington. Tom and Alan, we thank you for making your dreams of a bikeway come true. We gratefully dedicate this website to you. We also applaud the efforts of Cathy Buckley at Central Transportation Planning Staff (CTPS) for her efforts in the design and construction of the Minuteman Bikeway. This website was developed by Jack Johnson and Stephan Miller. The webmaster is Stephan Miller.